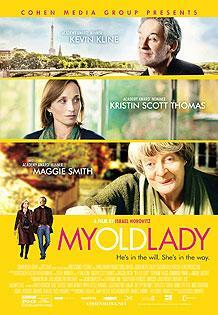 The Hope College Knickerbocker fall film series will feature “My Old Lady” on Monday-Saturday, Sept. 29-Oct. 4, at 7:30 p.m. at the Knickerbocker Theatre in downtown Holland. Mathias Gold, played by Kevin Kline, is a down-on-his-luck New Yorker who inherits a Parisian apartment from his estranged father. When he arrives in France to sell the vast domicile, however, he’s shocked to discover a live-in tenant who is not prepared to budge. His apartment is a viager - an ancient French real estate system with complex rules pertaining to its resale - and the feisty Englishwoman Mathilde Girard, played by Maggie Smith, who has lived in the apartment with her daughter for many years, can by contract collect monthly payments from Mathias until her death. The dramatic comedy was written and directed by Israel Horovitz, making his feature film debut, and is based on his play of the same title. It has a run time of one hour and 47 minutes, and is rated PG-13. Tickets for the film are $7 for regular admission and $6 for senior citizens, Hope College faculty and children. Tickets will be sold at the door but are also available in advance at the Events and Conferences Office located downtown in the Anderson-Werkman Financial Center (100 E. Eighth St.). The office is open weekdays from 10 a.m. to 5 p.m. and can be reached at (616) 395-7890. See photos from the 117th Pull won by the sophomore class on Sept. 27. Students and professors at Hope have joined collaborative forces in one of three works by members of the faculty featured in this year’s Art Prize.